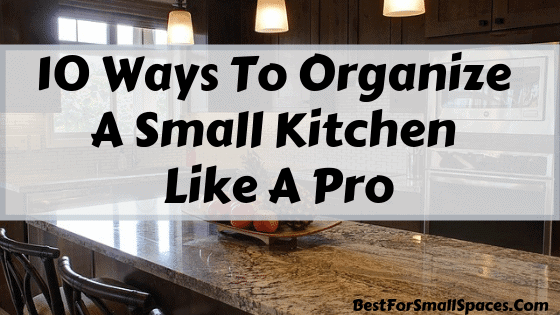 April 13, 2019 0 comments on "10 Ways To Organize A Small Kitchen Like a Pro"
Let’s be honest, having a small kitchen can really be a major headache for a lot of reasons. In addition to cramped countertops, undersized appliances, a tiny cooking space and often little to no cabinet space for storage. What’s even worse is how quickly it gathers various clutter. I know you already know first hand that keeping a tiny kitchen organized can be a bit of a challenge but this doesn’t mean it’s impossible. Let me share some good news to all the small-space dwellers out there. Gather up as I will be sharing with you different ways on how you can make your small kitchen a workable room. I’ve scoured the internet to look for the most clever small kitchen hacks out there. So if you want to learn something new on how to organize a small kitchen, then please keep on reading below. Decluttering is obviously the first step to organizing any room and it’s quite amazing how kitchens tend to have the most unique kinds of clutter compared to any other room. So make sure you go through each item in your kitchen and decide if it’s time to toss them away. For instance, you can go through your dish towels and discard any that are already past their prime. Take a look at your cleaning supplies and throw away things you are no longer using. If you have several bottles that contain the same product, you can just combine them. Is this an extra item? How many wooden ladles do you really need? Do you really need three ice cream scoopers? Are you really going to use all of these cooking sheets? 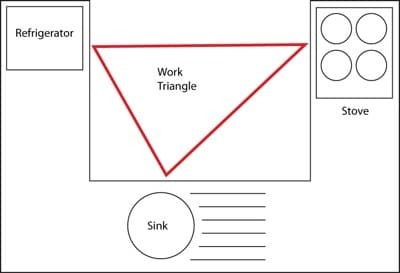 Have you heard about the kitchen work triangle? It’s a triangle shaped layout between the sink, fridge and oven, and will help you easily move around the kitchen. You can mentally assign work zones in your kitchen: cooking zone, preparation zone, cleanup zone, dishware storage, and food storage. You can also add other zones that you want. For instance, if you love baking, you might want to add a baking zone. This will help you organize everything by keeping things in their proper places. Make sure you store items according to their related zone. 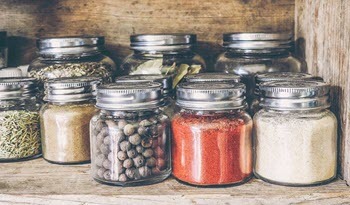 For example, chopping boards, spices, knives and other utensils you need for prep should be stored where you do most of your prep work, in the preparation zone. This is the best way you can develop a great cooking flow. You also should have a place for everything. Place the items that you regularly use in easy-to-reach areas, while you can place items that you hardly ever use in the higher, harder-to-reach areas of the cabinet. There are a lot of clever ways on how you can maximize storage space in your small kitchen. I will teach you two tricks. Make extra storage on the door. You can make the most of your pantry space by using the inside of the door. On the inside of the door you can attach small baskets to store canned goods, sodas, spices and a lot more. You will be surprised how much extra storage you have once you take advantage of this area. Use pocket organizer. Do you have some sewing machine skills? Then you can make your own custom-size pocket organizer. You will find a lot of tutorials all over the internet and it’s quite easy. Otherwise, you can just purchase an inexpensive over-the-door shoe organizer. Cut it to size so it will fit inside the doors under the sink. This will give you many pockets for storage. Turn one shelf into two. Just because you are short on space doesn’t mean you have to set aside your love for cute mugs. You can purchase stackable shelves or shelf risers so you can multiply vertical storage space. This will give you additional room to store your dishware. Implement a first in, first out system in your pantry by placing the newest containers and boxes behind what’s already open. You can keep things even more organized by using bins with labels or clear containers. This will help you save space and easily find the item you need. You can also make a list of what’s inside the pantry and attach it on the door. For your wasted wall space, you can transform it into a brilliant pans and pots wall by using command hooks. This will allow you to easily grab these clunky items and free up your cabinets to store those less appealing items. If you don’t have mobile storage in your kitchen yet, now is the best time to purchase one. In addition to being affordable and super cute, rolling carts can carry almost everything, from condiments to cleaning supplies and you can place it just about anywhere in your kitchen. Using the backsplash area is another incredible way to keep your counters free of clutter. Here are some ways on how to do it. Dry the dishes up high. Dish drying racks can really take up a lot of counter space. You can purchase a dish drainer, that can be hung on the wall. Get rid of the knife block. A knife block will take up a lot of cooking and chopping space. Instead, use a magnetic strip on your backsplash, that will hold several different sizes of knives. Mount baskets on your backsplash. Do you know that items like onions, garlic, tomatoes, potatoes and summer fruits don’t like the fridge? You can show off their natural beauty by storing them in baskets mounted on your backsplash. You might be surprised how tension rods can become a tremendous organizational tool in your tiny kitchen. You can use it to create pantry dividers, to create an extra shelf for your spices or to make hidden paper towel storage. Fortunately, there are already a lot of items on the market today that will help you figure out how to organize your small kitchen. For instance, you can purchase over-the-sink cutting boards, to help you save valuable counter space. There are also cheese graters, measuring cups, colanders, and funnels that collapse so they are much easier to store. Those magnetic spice containers that you can attach to your refrigerator are also pretty impressive. The kitchen is definitely the heart of the home, and it is very important to keep it as organized as possible. It’s the best way you can save yourself considerable time and effort. Plus, organizing is not rocket science, just keep on trying different ideas until you find one that works for your needs. How about you, have you ever tried organizing your small kitchen? I would love to hear your favorite tricks and hacks on how to organize a small kitchen. Let us know in the comment section below.